jozjozjoz.com :: brain barf... yum! 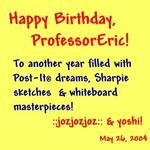 : Happy Birthday, ProfessorEric! I'm glad I got to see you last night! Here is ProfessorEric's Post-It Art, happily displayed on my file cabinet at work. Ooh Happy Belated Birthday! Hope you had a great one! can't believe i've known the profe for 24 years but i guess it's true... the day he was born someone gave me a stuffed lion, but it was no consolation for my new little brother. Of course, Profe being more durable than the lion, i still have him, though the toy is long gone. the profe is more fun, anyway! ha!